Truthfully, it was a grueling trip to Alexandria, Egypt. We began with not getting a full night’s sleep on Thursday as our fire alarm went off in the building at 3:00 am. once that happened and the police and fire fighters arrived only to find nothing, thankfully, we just could not go back to sleep. Did we smell smoke, something not right? Did we hear a crackle? Sleep without sleeping until getting up early to finish last minute details. This included errands, and then the dreaded packing of the final clothes. Three Army/Navy surplus duffel bags, one big blue REI duffel, and one of our old cherished Danish H2O bags later, we were down to our trusty Patagonia bags that have been with us on many trips home and abroad. As no surprise to my family, I had more school supply items than personal garments and shoes. Those who know me are probably very shocked, but remember, there are awesome stores here in Alexandria. Oh yes, on to the trip. We decided to just stay up as we had to leave for SFO by 2:15 am. With our adult children lovingly and patiently putting up with my craziness, we made it to blastoff time. Tara kindly dropped us off on her way home to San Francisco. We were second in line, and that is quite important to me, as many of you know. We were checked in with a hiccup – the agent couldn’t get the machine for baggage to work. Thank goodness we were there early. Checked in with our tickets and carry-ons, we were off to the TSA. Having our GOES clearance is awesome. Sailed through and to the gate. Then to sit and watch for one of our colleagues. We found each other and then waited a little while longer for the boarding process on Jet Blue. Here is the tough part. Jim and I had the last row which meant the sits stayed in the upright position the entire flight. Poor Jim is still dealing with very swollen knees. The family beside us with a child having bathroom issues did not help either in trying to get any rest. At least 5 1/2 hours later we landed in New York. We navigated our way to the proper terminal and then onward to the Gate area. Right across from us was a pub serving breakfast all day. Yes! Bacon, sausage, and eggs! As we finished I had the intuition to check on our seats. Sure enough, unbeknownst to us we were to recheck in for new boarding passes. Glad I have the sixth sense as we were able to get our new boarding passes and the also had a huge consequence – where our luggage would go. Whew! We were able to board with no problem, all three of us sitting together and in seats with reclining ability! Now for a flight of 9 1/2 hours. Egypt Air was really nice. Comfortable for a long overseas flight and they had my meals perfectly made. They were quite delicious for airline meals. They somewhat reminded us of our many trips on Singapore Airlines with the warm towels, nice headphones, and booties. (Most people know our flying rules of never taking off our shoes. We not only want to be sensitive to those around us, but also it keeps our feet from swelling as badly and not being able to get the shoes back on. Even with compression socks it is just not polite.) Back to the trip. We landed safely, disembarked, bought our visa for $25 (reimbursed), and then through customs to the waiting welcomes of Nathan, Randa, and Mohammed. What a wonderful and warmly sincere greeting! Then the walk to the vans and forward to our venture through Cairo and toward the Pyramids of Giza. Lunch was at a former hunting palace for a former king and it now a hotel. Everything piece of wood was hand carved. We were fed a feast of wonderful dishes while gazing in awe at these grand old pyramids. We then continued our trek to Alexandria, a three hour ride. Fascinating scenery kept us in awe. We were given keys and directed to our apartments. Did we ever need sleep. It did not come easily as we are in a big metropolitan city. Like any city, it never sleeps. Since we have arrived, we did get a bigger apartment which is much better for the big guy. We have more room to have people over. We have been in our office and classroom. More on this later. We have been so busy with orientation and becoming acculturated. Arabic lessons are fun and it is refreshing not to be bombarded with the testing mindset of teaching. More on this later. Yesterday we ended the busy day with dinner in the Villa at our Head of School’s apartment. Wow, Nathan has a tremendously inviting rooftop. The food was excellent. Today was a trip to a private beach, swimming in the Mediterranean, and tomorrow is a full city tour of Alexandria ending with dinner at our Principal Randa’s home. What an indoctrination to Schutz American School. The rest of the regular faculty come in this weekend as we start our week on Sunday. I cannot say enough about how we have been greeted, excepted, cared about, and made to feel genuinely welcome. More will come as next week we get into meeting the rest of the faculty and staff, share about Jim’s office and my classroom. Oh, yes, and the funeral going on behind our apartment is another experience you will read about. Just wait! Whatever, just don’t believe everything you read or see in the news and general media. This land is a place of pure awesomeness! First Graders and Fall Festivals. My First Graders were excited, but still performed well on their spelling tests, wrote stories about scarecrows, and managed to have Physical Education all before going home at Noon, today. A major fundraising event for our Parent/Teacher/Student group is the annual Fall Festival. 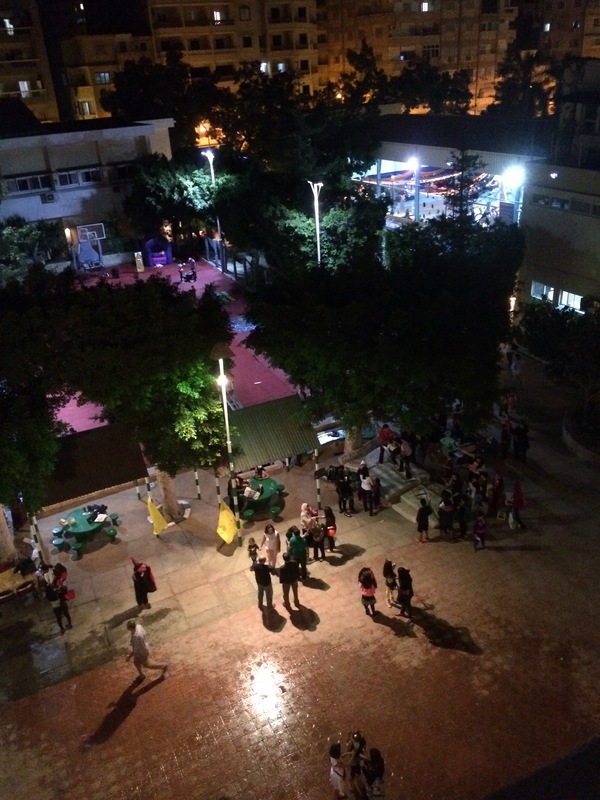 The theme is always based on Halloween and involves the whole campus. 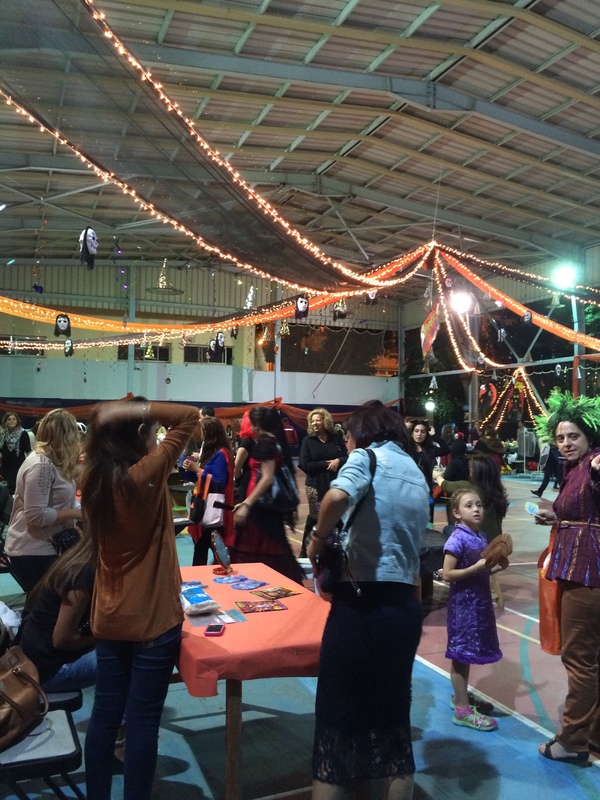 It was an event full of assorted activities, games played for prizes, a haunted house, sack races, and a variety of foods available. Most exciting was to see so many people together, sitting and talking, children enjoying their families, and the interaction between, drivers, nannies, parents, and sibling and friends. This Egyptian culture is just like our home town cultures you would find throughout the States. On to this amazing class of 7 girls and 7 boys. There are children at grade level and some who are soaring at beginning Second Grade level in Reading and Math. In a question time with each child, the final answers given on what they each want to be when they grow up and get a job was the following: 1 dentist, 1 kids’ cancer doctor, 1 bone doctor, 1 general doctor, 1 archeologist/computer fixer, 1 singer, 1 pianist, 2 veterinarians, 1 scientist, 1 pyrotechnic engineer, 1 engineer for car design, 1 professional tennis player, and 1 cook at McDonald’s. Wow! What a collection of careers. Their tasks will be learn about these professions with their 5th Grade Buddies and video a mini Ted Talk at the end of the year for their parents. Our school requires the last parent conference be student-led. This requirement had to have my quirky twist so we are going to present First Grade Ted Talks for the students to present their future personal careers and what they have learned this year that will help them get there. These students are writing delightful stores with plot, setting, characters all planned out, and yes, they know what those words mean. Their vocabulary is growing by leaps and bounds. Remember: these wunderkinder speak, read, and write not just two languages but most of them have a third language! There is hope for our world for peace if we just give it a chance. Here are First Graders with grandiose dreams and talents already exhibited. Here are families, relatives, nannies, drivers, and friends who have different belief systems all getting along to sit and eat, chat, have a delightful fruity drink, and just plain get along. With the campus teeming with hundreds of people, everyone had smiles, genuine greetings, and caring for the little ones as they enjoyed this festive time. The age of wonder for First Graders with dreams, the collaborating in a community, and the “getting along” of peoples is priceless. We can do this, World, if we just show the love, kindness, respect, and friendship exhibited last night! These photos don’t even begin to show the awesomeness of last night! 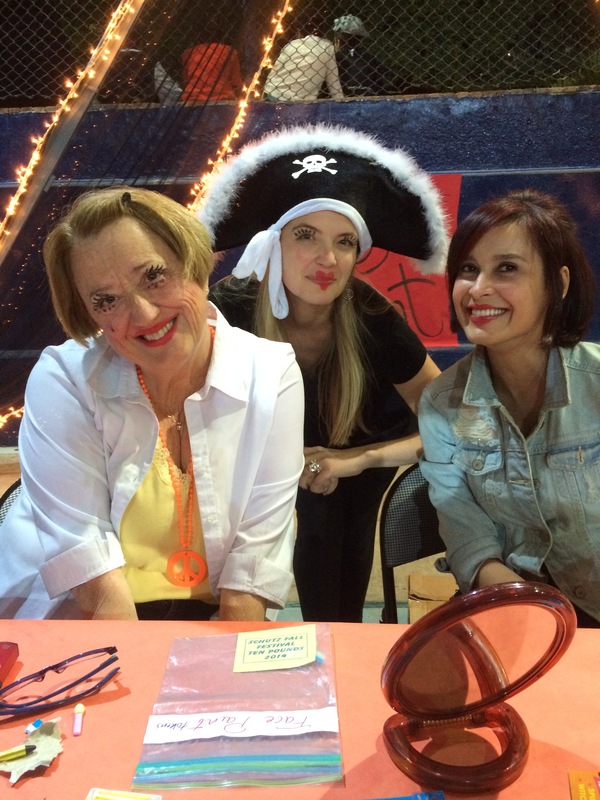 The three awesome ladies are teaching colleges! The Exodus, not the movie, ours! We cannot get Jordan out of our minds. The Dude and I reflected this week on our latest trip. Coming out of Egypt (yes, we kept singing the Desmond Dekker song “The Israelites”) we were stunned as we watched the stark landscape underneath us. The barren land, mountains with steep valleys, the sparse signs of water, spying only the Suez Canal and the Jordan River gave us a small perspective of what Moses and his grand parade of tribes must have seen. Coming out of the beautiful and modern airport continued to be the starkness with small oasis upon oasis of green. It was dark when we made it into the center of Amman with bright lights on modern cranes at the tops of nearly finished high-rises, flashing billboards, a truly modern city. Not until morning would we see the tops of the modern with the leftovers of the ancient ruins and the staples of religion. 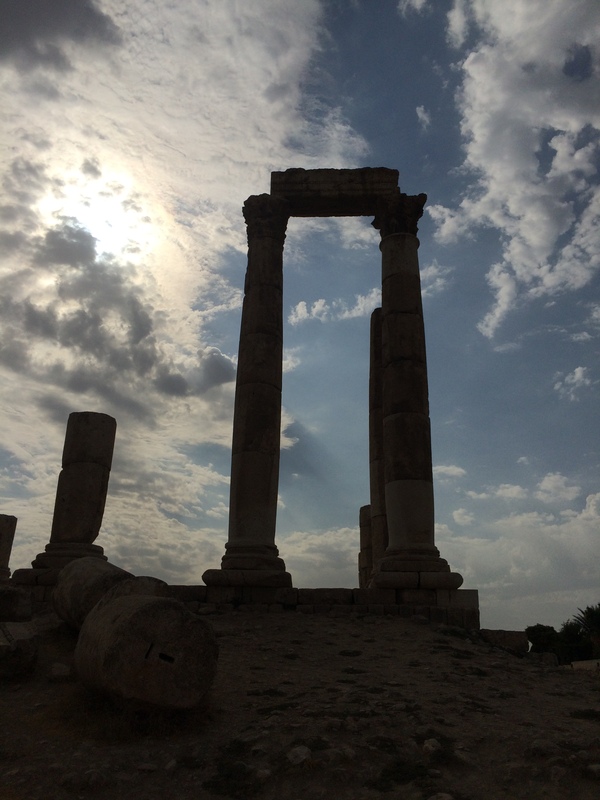 We would venture to the ancient Roman city of Jerash, an all day adventure as it is huge. Walking in temples to Roman gods and churches based on Christianity, small marketplaces scattered throughout and a grandiose amphitheatre. Large olive oil presses and remaining wooden doors, stone archways opening to beautiful views of other ruins or the surrounding green-flowered hills and modern city. From there we ventured to Ajloun Castle, overlooking the three major wadis that lead to the Jordan Valley and beautiful green olive groves on the surrounding hills. One day done! 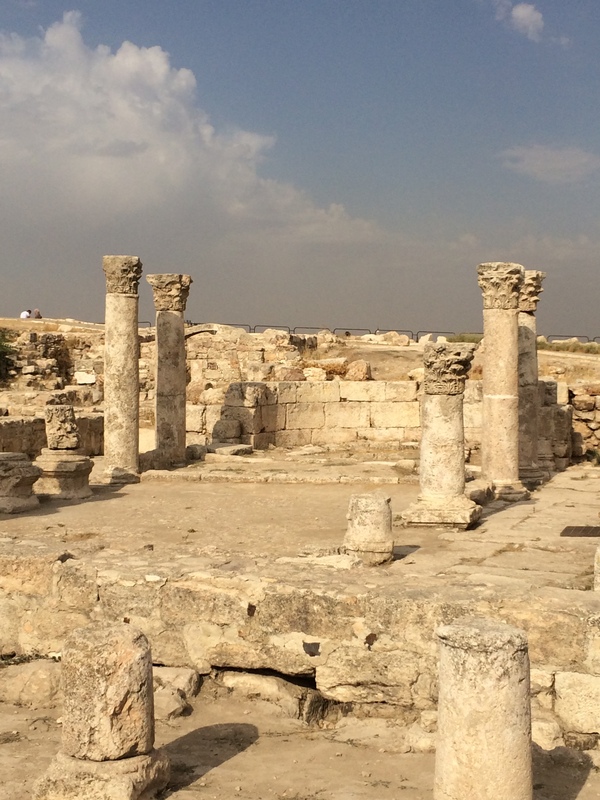 By-the-way – Amman (known as Philadephia in third century BCE) is one of the oldest continuously inhabited cities of our wonderful world. A day in Amman provided a visit to the Blue Mosque or King Abdullah Mosque, the newest in the city, situated across the street from an Orthodox Church, getting along quite well, side-by-side. Then we were off to the Citadel (Jabal Al Qal’a) and Roman Theatre, with the Odeon smaller theatre next to it! The Citadel, which has been in existence since the Paleolithic Age, gives a commanding panoramic view of Amman with the stately minarets of the many mosques, and has the somewhat in tact Temple of Hercules and the Great Temple of Amman. There has also been an exhbit of the Dead Sea Scrolls in the museum. In the heart of Amman is the King Hussein Mosque. Another day took us to Mt. Nebo where Moses was able to see the Promised Land. We were able to see the center of Amman from this high peak (2,680 ft. above sea level), the valley of the Jordan River, Jericho, and if it had been a bit clearer – Jerusalem. On the top is a nice museum, a Byzantine chapel, and a unique sculpture of a serpentine cross created by Giovanni Fantoni. It symbolizes the bronze serpent created by Moses and the cross on which Jesus was crucified. On down the mountain we were in the Jordan Valley searching for Bethan Beyond the Jordan. Here we took a tour of the area of John the Baptist and where he baptized Jesus Christ. This was also the area of the first three days of temptation. The actual site has been comfirmed by archeologists from the Billy Graham Organization. Sadly, the river is only a pittance of what grandness it once was. Both of us put our fingers into the river. The small Orthodox church build near the site is small yet stunning. This is the first place I found myself in an automatic constant state of prayer. It was interesting to see the Israeli flag flying just 15 feet away from us on the other side of the river. From there we were in the car and off to the Dead Sea. Although the saltiest and lowest point on earth, we were somewhat disappointed. Yes, we floated easily, tried the mud, but overall it is very rocky trying to enter and you have to wear special shoes that slip and slide all over the rocks. Other than saying we have been in the Dead Sea, well that is all we can say other than it is an expensive tourist trap. Now to another day! 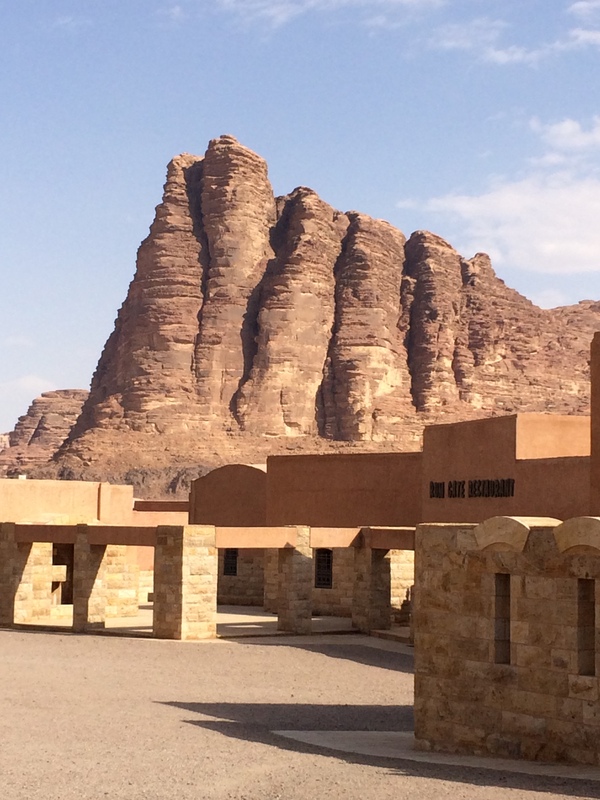 On the schedule: Petra, Wadi Rum, and Aqaba! 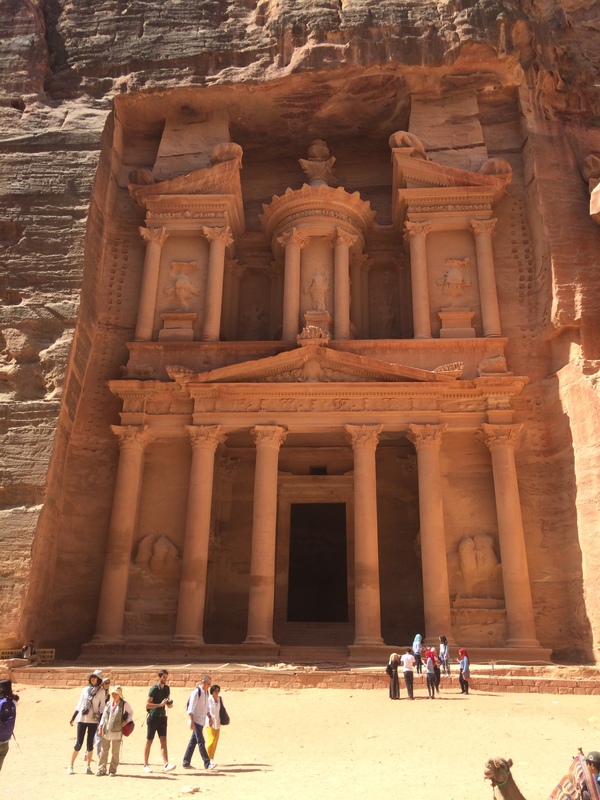 The city of Petra was built possibly as early as the 5th Century BC. It requires getting there early to avoid the extensive crowds and heat. 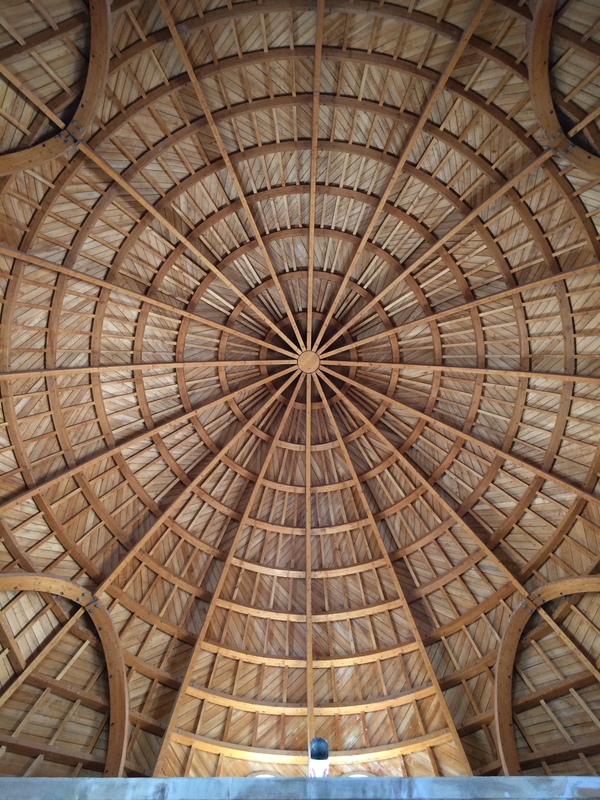 The architecture hewn out of rock and the water conduit system are amazing to see. Some historians say it is build on the slope of Mount Hor. THe stone is absolutely a stunning rose color with variations beyond belief. We saw all but the very top requiring 800 steps of ancient steps in intense heat. Sorry, not going to do it. We could have taken donkeys, but the animals do not look well cared for. There are many biblical references to Petra. 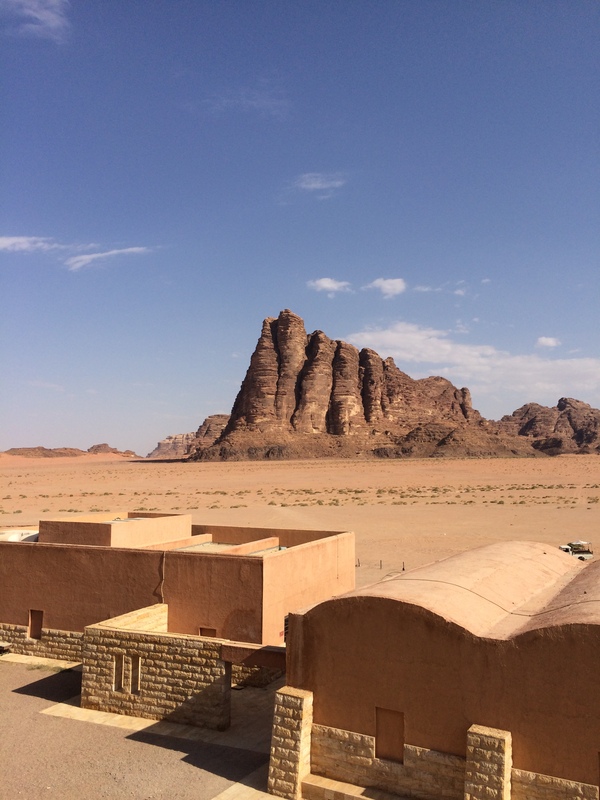 Off to Wadi Rum, Lawrence of Arabia fame! This area is also called the Valley of the Moon. It is a valley cut into granite and sandstone. Many cultures lived here but a large group was the Nabateans. You can still see the petroglyphs and temples they left. T.E. Lawrence passed through several times while there during the Arab Revolt of 1917-18. Seeing the Seven Pillars of Wisdom rock formation made me want to reread “The Seven Pillars of Wisdom” by Lawrence. If you read it though, know it is not about Wadi Rum. It is just a good read! On a clear day you can see the Red Sea and the Saudi border from the highest point. This area is still the home to several hundred Bedouin inhabitants. Trivia – The following films have used the Wadi Rum: Lawrence of Arabia, Red Planet, Passion in the Desert, The Face, Transformers: Revenge of the Fallen, The Frankincense Trail, Promotheus, Krrish 3, and May in the Summer. The sad part was a dead camel at the foot of a hill, decomposing. The little herd of wild camels enjoying a lunch in the tomato field was enjoyable as they looked up with green lips chewing the delightful plants and tiny tomatoes to have their pictures taken. The landscape of this diverse area will stay with me forever. Now to Aqaba before sunset! We drove through a valley filled with agriculture with the granite and sandstone mountains and hills surrounding us. As the valley came to a point we traveled through canyon-like mountains much like going through Colorado or California to Nevada. As the rock siding started to clear away was the city of Aqaba, a major port city for Jordan. This city is on the West Bank and the Red Sea. It is also called The Bride of the Red Sea. It was founded in 3989 BC. It was the junction of trading between Asia and Africa, and King Solomon build ships in Ezion-Geber, which is near Eloth in Edom on the shores of the Red Sea. (1 Kings 9) We were able to watch the sunset on the glistening Red Sea and decide to call it a day with drive back to Amman, our home for the week. Through this trip, we felt we had traveled many of the areas the Israelites had traveled as they followed Moses. We felt we had traveled the areas of John the Baptist, Christ, and many of the Disciples, and others who have served as missionaries. It was a time of healing for my dietary needs and a time to get in touch with our spiritual and historical needs. As with our travels in Egypt, we found the people of Jordan, no matter where we were, welcoming and kind. I know all of us are constantly talking about priorities, but have we focused more on the lesser of the important? Being a severe Celiac in Egypt has been quite the struggle. Going to Jordan for a week did not help in my frustrations as I was fed very well, gluten-free every meal (even boxed lunches for our day trips), and had the most sincere care by Mali, Chuck, Omar, Mohammed G., and the attentive supervisors, waitstaff, chefs, Nadine the Concierge Supervisor, salon, every single person at the Amman Four Seasons property were extremely and sincerely caring. Even pictures of all the gf products they were using, and directing us to the store (with a driver) to purchase items to bring back with me, yes, I was totally spoiled. But now I am back to reality in Alexandria. After knowing that I could get over the constant stomach pains, up all nights catching catnaps on the bathroom floor, I think a solution has been formulated. 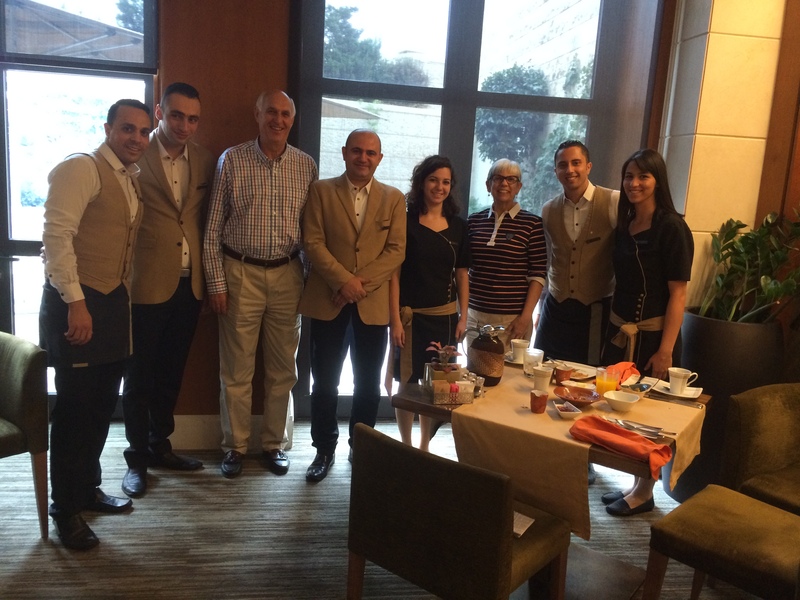 I am now able to purchase the gf foods and be reimbursed, have a translator, the Four Seasons San Stefano might even be of help in making breads, but here is what is important – my new-made Egyptian colleagues and friends care. My assigned Teaching Assistant, the awesome Ingy, is not just someone who assists daily in the classroom. She has become a friend, a caring friend and colleague. Ingy brought real local made yoghurt to me yesterday and I cannot tell you how good it is. I felt like I was getting Greek yoghurt from the little local stores (Bruno’s or Nielsen’s) in Carmel-by-the-Sea. Next, Nadia (assistant librarian) brought in fresh kiwi and avocadoes. Yum, yum. The TA in the neighboring First Grade, Aynour, has found out where a gf bakery and a grocery store with a large selection of products are in Cairo. We are going next Friday! Her dad is my contact with the Four Seasons San Stefano. Secondly, the staff here – AbdelAziz and Amr have met with me, and Ingy came along to help with any translations and I now have them helping me with getting my health back to normal. Their priorities are nothing but caring. How often do we perform the little actions for someone because it has become a priority? I ask you to inventory your priorities. I know a priority is my health and taking care that I not get ill with complications from Celiac Disease. My major priority is to be thankful for all of the people mentioned in this blog. I care that they care. They are the perfect examples of humanity. Take a day and count your blessings. I get questions, often, about how it is to live in a Muslim country. My answer is “I live in Egypt, a nice country full of very nice people. I teach students who are like students anywhere.” There is a mixture of beliefs working and caring side-by-side each and every day. There are good people and there are those who have twisted interpretations. Both are found in each and every country. Make it a priority to turn off the news and turn on face-to-face conversations and friendships. Make living a priority. Count your many blessings! As we travel more into the predominately Islamic cultures, we experience from-the-heart genuine friendliness, kindness, caring, and interest in what we think and are experiencing as we travel through the countires. Staying at The Four Seasons, Amman has been wonderful as the staff in the restaurants, front desk, concierge, front office, throughout the entire hotel have been very accommodating with my gluten-free diet, but most of all in sharing about the culture here. We have had wonderful, casual chats with staff, and the young couples who were observing weddings with us. No one has treated us poorly or unfairly, or as the Americans. We keep getting invited back to visit! It is more expensive here than in Egypt, but the roads are wonderful, and the gas is cheap and the same price everywhere. We have driven to every place we have visited, although we may take a taxi to Rainbow Street later today as the Eid is over and everyone is back to work. We see why a lot of Hollywood film makers use this beautiful and diverse land for their backdrops. Lawrence of Arabia, Raiders of the Lost Ark, Transformers, and many others have used the unique geography found in this land. This is what we like about travel, we learn so much! We cannot sit still and not see what is around us. We still need to visit the Blue Mosque, right down the street! I will write about the rest of our adventures later. More to come on this adventure. I want to give time to the trip to Bethany Beyond the Jordan where John the Baptist lived and where Jesus was baptized by him in the Jordan River. This is also the area where Jesus began his time of temptation. 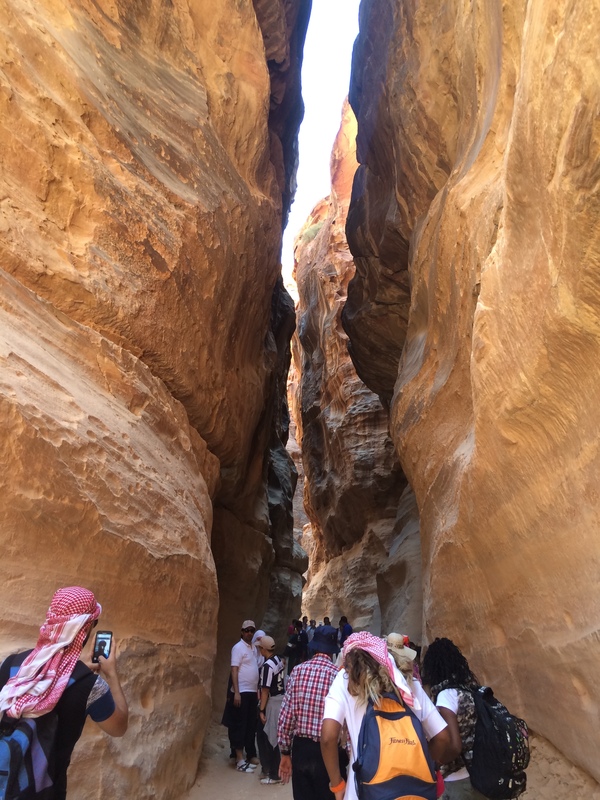 We are loving this beautiful and diverse land of Jordan and its people! More to come.